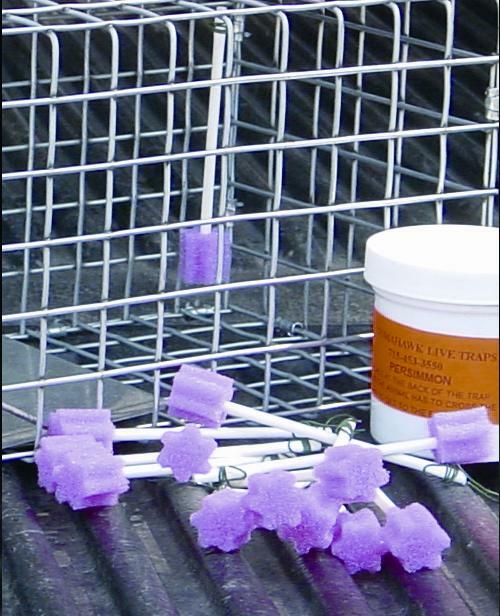 Use these Bait Sticks when using scented bait or paste to help attract most animals into your live animal trap for easier trapping. Apply any scent, bait, or paste on to these bait sticks then hang them inside of your trap to lure the desired prey into your trap. All of our bait sticks come with a metal wire tab assembly that can be secured inside of any open grid trap. For enclosed traps, just place the sented bait stick at the rear of the trap to draw the animal in. Proper baiting techniques are very important for trapping that target animal, and our Bait Sticks & Paste Baits make it easy!! Our paste baits are very effective year round because of their thickness. They hold up during extreme weather conditions. The baits are sold in 6 oz sizes, which are good for 15 to 20 settings. For optimal baiting, dip a bait stick into the proper paste bait, and hang the bait stick at the back of the trap, so that it dangles at eye level behind the trip pan. The animal will enter the trap, see and smell the bait stick, and step on the trip pan as it investigates the bait stick. NOTE: For successful trapping of nuisance animals, wildlife, stray pets you should not only use the correct live trap but also bait and place the trap correctly. Learn the habits of your targeted animal: what foods it eats and the trails it uses to locate its food. ShopTJB recommends that you immerse your trap in boiling water or place it outdoors in the sunshine for several days to help remove any unwanted scents. These unwanted scents can easily repel your targeted animal pest from your live trap. When carrying, setting or baiting your trap, wear gloves to hide your scent from animals. Human scent will scare many animals from your trap. You also do not want to handle animal bait with your bare hands.